As I mentioned last week, there is a dearth of trailers that have me excited out there at the moment. 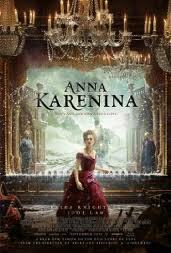 So I thought this week I would feature a trailer that has been out there for a while, that for Joe Wright’s take on Anna Karenina. I haven’t read Tolstoy’s classic novel, and probably won’t get around to it before the film opens. I really like the look of this film and it has a lot of really interesting people involved – Wright, writer Tom Stoppard and a pretty intriguing cast. I’ll be keeping an eye out for this one when it opens, especially as the small scale sets suggest that this is going to be an interesting take on a classic narrative. What do you guys think? I freakin’ love this trailer! Very excited for this movie. Big fan of Wright and the cast. If anything, the visuals will be amazing. I agree, think this looks pretty spectacular. Though I must admit, I’m not sure if I have ever seen any of Wright’s films. Atonement is his best. Pride & Prejudice is worth checking out. Hanna proved very divisive but I really liked it. Oh ok, well I have seen Hanna. And yep, obviously divisive cause I hated it. But I would really like to check out Atonement, may do that soon.